Fall has officially arrived, but here in Louisiana that still means high temperatures. A few leaves are beginning to change. One of the first local fall flowers are spider lilies, and we spotted this one yesterday. I looked up verses about seasons and was reminded of this truth. Thank you for joining Scripture & A Snapshot. Leave a comment with a verse that God has placed on your heart this week, or leave a link to your own post sharing a Scripture and a snapshot. Take time to visit some of the other links, too. Be sure to visit Kym! I love this. It is us who sometimes blow in the wind. The word of the Lord is constant. Again, thank you for hosting S&S for so long. What a fantastic reminder! 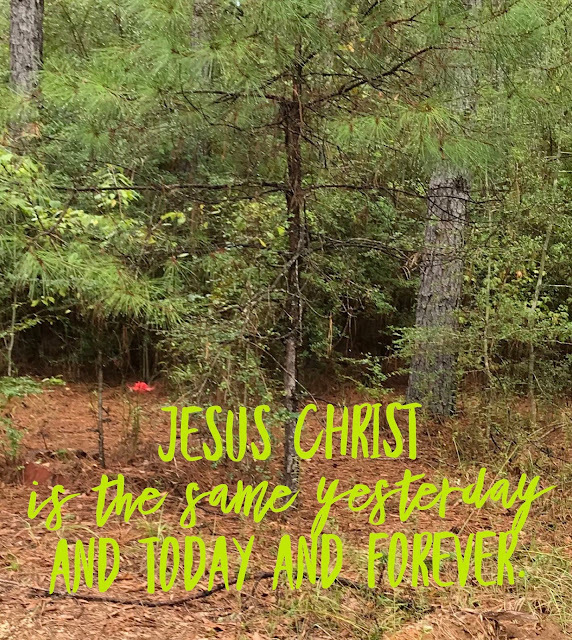 It doesn't matter the season - Jesus is the same. Here for us.